A great all around amp! Perfect for beginners and for lugging around to practices. Headphone jack allows for quiet practice. 10 Watts of power are provided through a specially designed 5.5" speaker. Master Volume Control. Two Band EQ with Bass and Treble controls. Weight of amp: 6.5 lbs. Overall dimensions: 9 3/4" wide x 10 5/8" high x 5" deep. Free guitar strap, instructional DVD, and cable now included! A great all around amp! Perfect for beginners and for lugging around to practices. Headphone jack allows for quiet practice. Also included is a free guitar cable and strap! 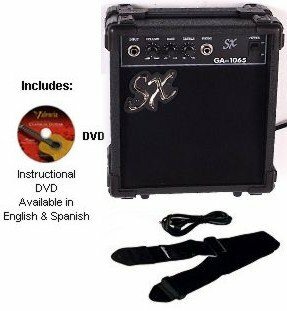 Free instructional DVD now included with this 10 Watt amp - powered through a specially designed 5.5" speaker. Master Volume Control. Two Band EQ with Bass and Treble controls. Weight of amp: 6.5 lbs. Overall dimensions: 9 3/4" wide x 10 5/8" high x 5" deep. If you have any questions about this product by SX, contact us by completing and submitting the form below. If you are looking for a specif part number, please include it with your message.